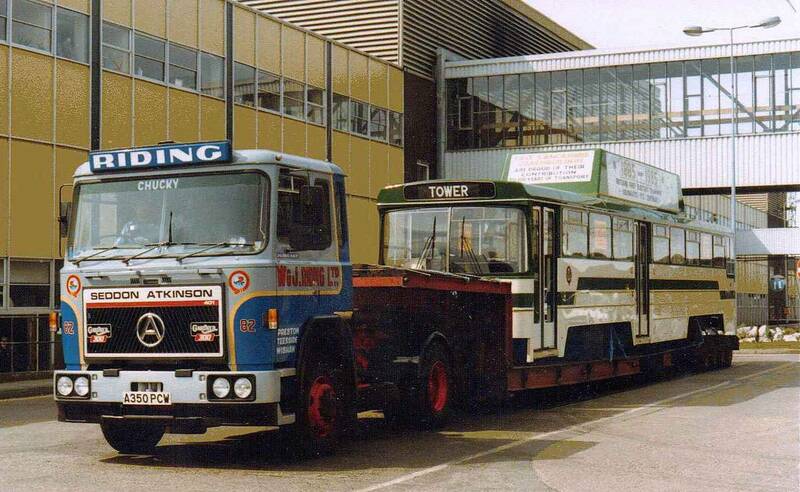 Tom Riding recalls below the movement of a batch of Blackburn built single decker tramcars to Blackpool in 1984. "I borrowed a long low height trailer in April 1984 from my good friend Don Parkin the then managing director of Smiths of Eccles. 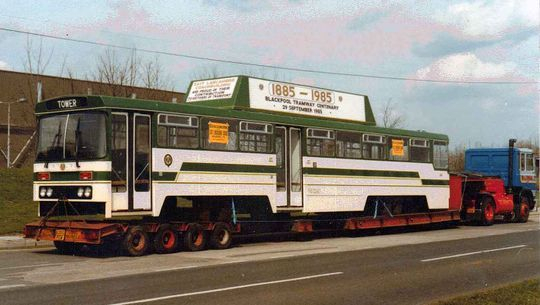 It was just the job for moving a batch of what was at the time a number of brand new 'Centenary Class' tramcars from Blackburn based East Lancs coach-builders to Blackpool Corporation's Rigby Road depot". The 20th of April 1984 and Seddon Atkinson 401 4x2 tractor unit Reg No A350 PCW Fleet No 82 'Jubilant' was assigned to move prototype Blackpool Centenary car No 641. Powered by a Gardner 300 engine and driven on a regular basis by Fred Squires it is seen heading west on the A6119 Ramsgreave Drive, the Blackburn ring road, on it's way to the Whitbread brewery at Samlesbury to be weighted prior to it's onward journey to Blackpool. Seddon Atkinson 401 4x2 tractor unit Reg No A350 PCW Fleet No 82 'Jubilant', driven by Fred Squires, is seen here after coming off the weighbridge at the Whitbread brewery on Cuerdale Lane Samlesbury. 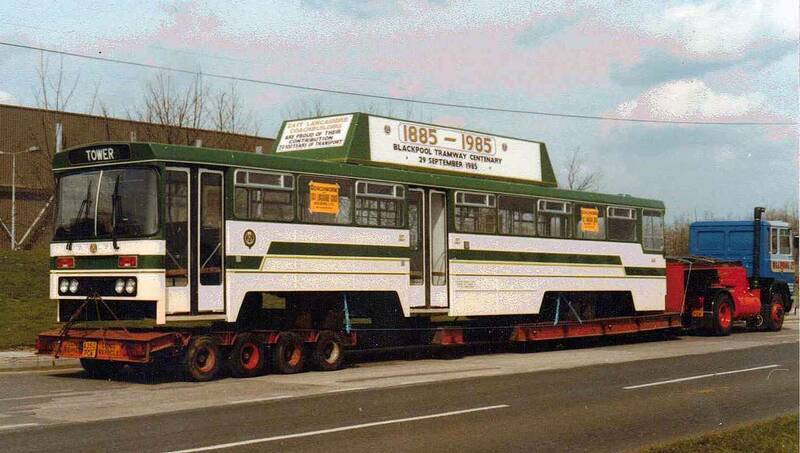 The tram was the first of this kind to be delivered to Blackpool Corporation, prototype Centenary car No 641. A close up shot showing the prototype Centenary car No 641 on the low height trailer that Tom Riding borrowed from Smiths of Eccles. 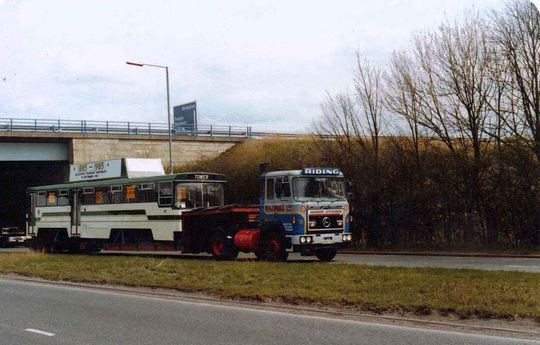 This picture was taken after it came off the weighbridge at the Whitbread brewery on Cuerdale Lane Samlesbury prior to its onward journey to Blackpool. Seen here passing beneath Junction 31 of the M6 near Preston on the 29th of April 1984, Seddon Atkinson 401 4x2 tractor unit Reg No A350 PCW continues on it's journey to Blackpool with the brand new prototype Centenary class tramcar No 641 on board. After being safely delivered by W & J Riding Blackpool Centenary tram car No 641 is pictured here on the 27th of October 1984 shortly after entering service with Blackpool Corporation. One of eight Centenary class cars operated by Blackpool Corporation all were withdrawn from service at the end of 2011 prior to the upgrade of the tramway.